Oh hey, who is this guy again??? We haven’t seen him…awhile. I imagine he’s never actually done the “Psssst” brand of “I just want to talk” before. He’s trying, okay? He… he saw it in a cartoon once. Where’s Hiccup when ya need him? Bloodcarver you can’t think this could have gone any other way. Shhhh? He’s in a sea monster’s home pool, next to an Avalon with bugbears in. He’s been detected. Unless he’s just worried about the human public. Alec: Y’ won’t be seen ‘ere. Just stretch up and talk. But no funny business. It’s possible dragons are somehow bugbear-proof, or there wouldn’t have been all this shock and surprise in earlier episodes that they’re still around. I suspect Stanley has been swimming around the poor dragon all the way up to the Avalon, trying to get him to play. 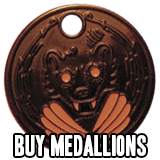 This is why dragons wanted medallions. It’s so damn hard to sneak anywhere, never mind just trying to get into a shop to pick up some fish and chips. 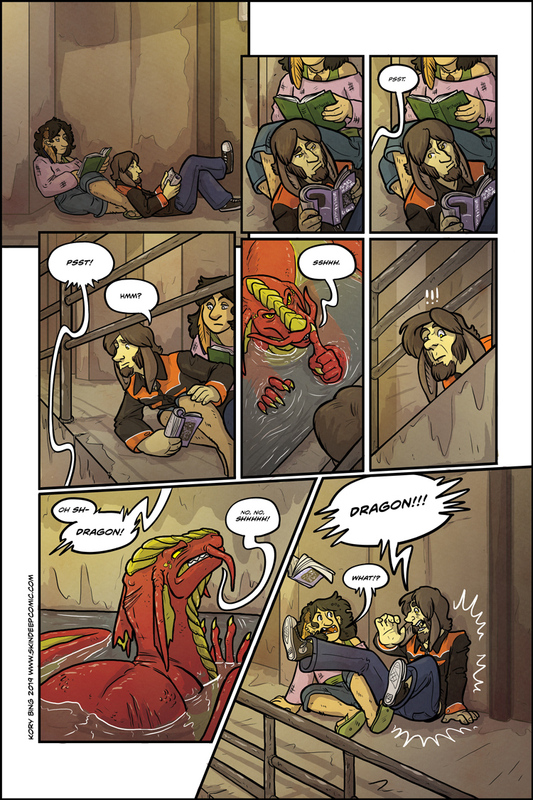 Given that dragons apparently nearly exterminated the most powerful magic users in the setting, I dare say they’ve got some tricks of their own. So page 1 is the cover? I got a friend who’s a dragon. He’s nice. Also, I don’t believe he ‘ll do anything stupid in front of the whole communitie and a huge messy-like monster who protect them. Poor Bloodcarver, he has no sense of appropiateness. And Greg has no chill. My expression was pretty much a perfect match for Greg’s in panel 6. Also, I love that these two nerds hang out and read books together. Her legs…. I wonder if she’s just relaxed and let her fur out (must be nicer for Greg to rest on) but the sweater really looks…bad. Kory, you are the artist – scruffy or texture, please? 2005, the ready-distressed ‘shipwreck’ style was popular. Bloodcarver looks cute when he’s doing the shushing thing. I really hope this dragon turns out to be nice and friendly, rather than trying to continue/finish off the Sphinx/Dragon war. It’s Bloodcarver. Despite the ominous name, he’s pretty clearly sick of the “us vs them” of the war and just wants to go on a nice vacation with his wife, damn it. Clearly he’s not getting that trip any time soon, though. oh man Bloodcarver looks so good!! 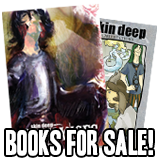 I sometimes re-read Skin Deep and it’s so clear how much growth you’ve gone through as an artist from seeing an old character that hasn’t been seen since the first chapter or so. Bloodcarver trying to be subtle. Things I never thought I would see. So very, very pumped for this chapter! Those are buildings on the dock walls, and riverside wharves. The Stanley docks are on the east side of Regent Road. The buildings and riverside wharves and docks are on the west side. In the final image of Illumination chapter 3, the image is looking east at the Stanley Docks, from roughly mid-channel, so those small buildings are effectively midground detail in front of the actual Stanley Docks building. Bloodcarver looks so adorable with his ears being droopy and wet. It might be the low angle but it’s precious. The first words out of Bloodcaver’s mouth should have been, “I’m sorry. Can you forgive?” Not because he is genuinely sorry, but a little humility might yield a better reaction. I think “Wait! I brought cookies!” might get him more breathing space than cutting straight to the chase like that. After all which is more believable? Which is more easily verified? Which is more tasty with milk? Well, great, NOW I’m worried that I’m more tasty with milk…. Because that was ever going to work. Wait, is Michelle in a hybrid form? When did she learn to do that? This chapter’s been a long while coming, but it’s sure not wasting any time now that it’s here! Good to have Skin Deep back. Ok, while sneaking up on people, jumping out and going “Shush” at them doesn’t seem like a great idea, being a big scary dragon might limit his options a bit. Would someone stop this satyr from yelling ‘Dragon!’ all the time?